Contact us if you want to go to sea. Anywhere. A good example of how tourism can be effectively developed and organized without slaughtering heritage and landscape, the Balearic Islands became an absolute favourite among northerners and Anglo-Saxons... Each island is profoundly different, but all share a very good service for yachts, excellent charter fleets, plenty of anchorages and opportunities for everyone. The eastern itinerary of Eastern Mallorca and Menorca is perfect for those who seek landscape, nature, heritage and secluded anchorages. Western Mallorca, Ibiza and Formentera are more for the beach lover and for those who like to pack heavy, with plenty of opportunities to use fashionable clothes. Calmer winds, warmer waters and a definitely hotter nightlife in a Caribbean style environment. Suggested tour : Colom - Cap del Freu - Cap Formentor – Ciudadela – Cala Algayerens – Fornells – Isla Colom – Mahon – Mallorca. Weather : certainly a lively destination, being Menorca the Island of Winds... The Mistral can blow from the Gulf of Lion and turn right, investing the area from anything between ENE and NNW... As you can see even on an atlas, the fetch is relevant, so you can expect a bumpy ride if the God of winds is in a bad mood. Breezes are strong and reliable all around the Balearics, blowing up to 20 knots. They rarely blow towards the coast, but most likely with an angle between 30 and 45 degrees… During our two months in the area, we had a strong prevalence of Easterlies… It’s a great sailing area, with steady winds and rare calm days. Good cruise planning, weather monitoring and the choice of anchorages are therefore of the utmost importance and cannot be overlooked. History and art : Ciudadela is one of the most beautiful ports and villages of the Mediterranean Sea, and Menorca is rich in prehistoric ruins and cultural activities. Mahon won’t be a boring stop, and Colom, another excellent harbour, has a fine fishing haritage. Gastronomy : Menorca and Maiorca, like most of the Mediterranean Islands, have a culinary heritage that is more attached to the land than to the sea, which is where the invaders came from. Maiorca has superb meat dishes, especially lamb and pork (hams, sobresadas, sausages), while menorca has a fine choice of pork and cheeses. The lamb leg at the Bardia in palma is the best I ever had. Fornells is famous for its expensive lobsters. The local fish soup is the caldereta de pescados Y mariscos. Overall, the French and the Italians can do much better, and at better prices. Prawns are so expensive that one loose the appetite. Port Colom: a bombproof and calm anchorage in a pleasant setting, with fishing village and small town attached. Perfect spot to begin and end a cruise. The bay is not small, and one cannot possibly row anywhere. Excellent holding ground. Cap del Freu area: there are two very pleasant bays between Cap de Pera and Cap del Freu notably Cala Molto (39 43'38''N, 3 27'13''E). Sheltered from anything except NE. If the weather is calm, or if the wind blows from the SW, anchor along the spectacular coast between Cap del Freu and Cap Ferrutx, a must for those who like to take the picture of the boat floating in mid-air… Exceedingly azure waters. The whole 7 miles of this stretch are somewhat savage and wind-beaten, but the effect will surely not be wasted on the lovers of alpine meadows. Cap Formentor: if you are moved by dramatic landscapes and wonder why so many artists love headlands (Chopin and Georges Sand came here for inspiration), sail around Cap Formentor. Properly impressive and deservedly historic, goes in to the Capes-to-round list. 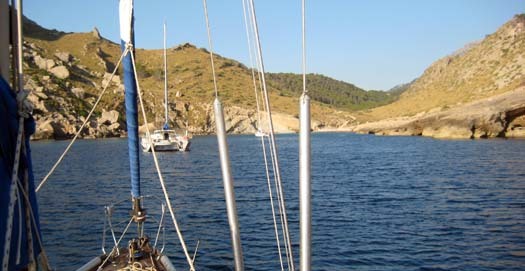 If the wind is from the S, anchor and spend the night in Cala Figuera, 4 miles W of the Cape (39 57' 09''N, 3 10' 38''W). This is a proper impressive anchorage, but be sure to have your ground tackle in order… The night breeze and S wind is funneled down the valley and can blow savagely. Ciudadela to Fornells: there is a wide selection of spectacular anchorages, well sheltered from anything but the N… Cala Algayerens(4 02' 56'' N, 3 55' 15'' E) is certainly among the best, with its shallow azure waters and white (if popular) beaches. Good holding on sand, perfect landscape, desert at night. Fornells: attractive village at the entrance of a spectacular natural harbour that offers several choices to spend a calm night. Anchorages is controlled but there are many mooring buoys (free of charge in 2008). Rolling hills with low trees all around, in a harsh, windswept environment. Fornells is one of the world capital of lobsters, but they do not come cheap! Fornells to Mahon: although more developed, this section of the coast deserve a praise for its several coves. Greener than the western side, we particularly loved the area around Isla Colom. In the various anchorages (and mooring buoys) one can find shelter from most winds. Cala Tamarells has spectacular beaches. The magnificent and secluded cove in the NE corner (onj the main island) has no mooring buoys but provides shelters from anything except strong NE. In this case, let go and lay out a line ashore in the cove in the NW end of Isla Colom. One of ouf favourite anchorages in the archipelago. Mahon: as Nelson used to say, ‘there are only three good harbours in the Med, Mahon, July and August’. If a change in climate has certainly written off the last two, it’s true that Mahon, the biggest natural harbour in the Mediterranean, deserve a visit for its size and beauty. Unfortunately anchorage is strictly limited to the (magnificent) cove just N of the entrance, linked to the main harbour with a man-made and well-lit channel, and to another area by the island in the middle. The citadel, forts, houses on the waterfront, and the harmony of the whole port make this a memorable stop.